Grassfed beef is healthier and better for the environment than the grain fed conventional stuff, but it is also leaner and therefore less flavorful. This is especially apparent when we are eating cuts like filet, but easily remedied by wrapping the filet in some quality pastured bacon! 2. Sear in the juices. Forget the grill. The best way to cook filet is in a cast iron skillet on your stove. This will give you a nice crust and seal in the juices. You’ll need to add a bit of fat to the pan; bacon grease works well if you have some on hand and I’ve also found red palm oil to be delicious (see note below on the sustainability of palm oil). 3. Make a paleo pan sauce. You don’t want to throw out any bit of the delicious (expensive!) flavor, so make sure you turn the browned bits in your skillet into a pan sauce. 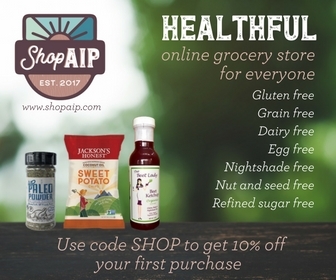 I created a simple one here that is extra nutrient dense and paleo autoimmune (AIP) friendly. 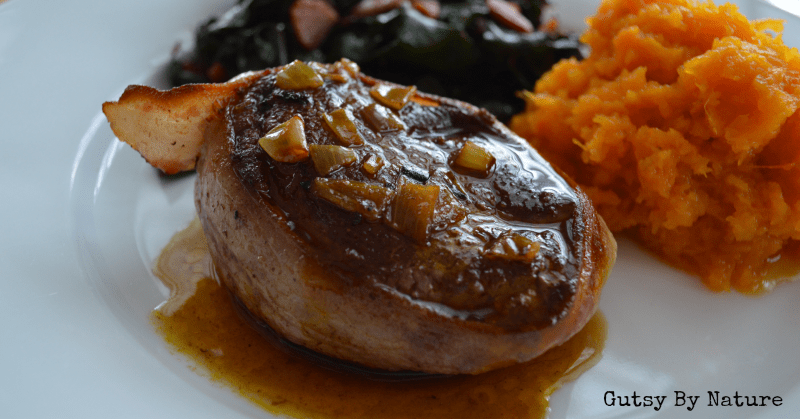 Conventional sauces add butter at the end, resulting in a thickened and tasty glaze to pour over your meat. If you tolerate grassfed butter, then go ahead and use it, but I first created this dish when I was still following a strict AIP diet and hadn’t reintroduced butter yet. To my delight, I found that the buttery taste of antioxidant-rich red palm oil had exactly the same effect. 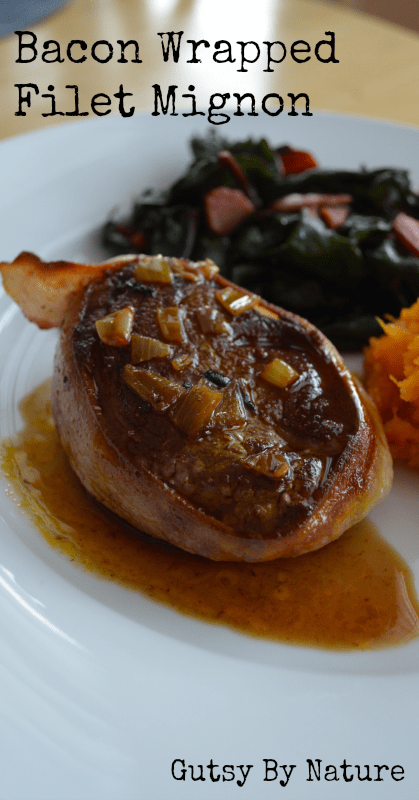 Grassfed filet mignon can be underwhelming, but not if you wrap it in bacon and add a tasty paleo pan sauce! Wrap bacon around outside of each piece of meat and secure with a toothpick. Sprinkle with salt and pepper. Over medium-high heat, melt cooking fat and heat until shimmering. Place meat in pan and cook for 3-4 minutes, then flip and cook 3-4 minutes on the other side for medium rare. For medium cook an additional 1-2 minutes; for medium well cook an additional 2-3 minutes, and for well done cook an additional 3-4 minutes. Remove meat tent with aluminum foil to keep warm. Cook shallot for several minutes in now empty pan, stirring constantly. Pour bone broth into pan and use wooden spoon to loosen browned bits. Continue cooking until reduced by about ½.
Whisk in red palm oil. Pour over steaks and serve immediately. Featured on Real Food Liz Weekly Menu Plan.